On the corner of 45th and Broadway, the Marriott Marquis stands right in the middle of all the Manhattan action. The hotel features its own amusement-like ride, the glass elevator, which zips up and down a 37-story atrium to your room and the city’s only revolving restaurant on the top floor. The 42nd floor features great views of the West side and the Hudson River. 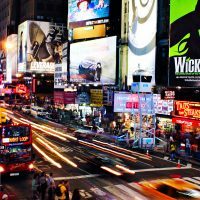 Children will love Time Squares’ neon lights flashing at all hours, the packed sidewalks overflowing with humanity, and the zany characters you’d be hard pressed to find anywhere else. Sometimes strange indeed, but it gives off a mysterious and energetic buzz that’s hard to top in the States. With a mind-boggling 1,892 rooms, you can choose from a standard room with two double beds and no view to a one-bedroom executive suite with glorious views of the city. The regular one-bedroom suite features views of the Hudson River and surrounding office buildings. There is a king bed and a sleeper sofa in the adjoining living room area. The Family Connector rooms feature a variety of options for families. The two-bedroom suites feature a king bed in one room and two double beds, plus a sleeper sofa in a second bedroom area. Some of these rooms also feature a separate living room area for even more space. Great weekend in New York, hotel excellent location on Time Square. We stayed in a deluxe room on 33rd Floor spacious clean room. Definitely visit The View rooftop lounge for views of New York skyline. Would recommend. This is not a hotel.... this is a legend. Marquis all around the world define themselves as mammoth hotels with spacious rooms, large number of rooms, good room space and ample of dining options. This one and the one in Dubai are like the chairman of the board kinda hotels defining luxury and class. Keep it rolling and I will keep coming. Well done and best of luck. Let's be serious. This is Manhattan. If you're in your room other than sleeping, showering, and changing, there's something wrong. Okay, we'll give you a little more time to unwind from the city's frenetic pace and check out the view if you have one of the upper level rooms. But then get out. 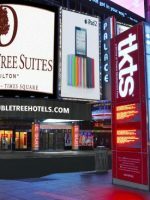 There are several Broadway theaters steps away from the hotel. 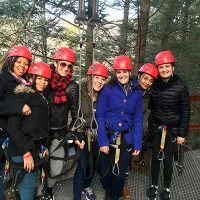 Located a half mile away, Central Park is where the kids can run to their heart's content at a number of playgrounds, rent bikes and pedal the 6-mile road around the park, frolic in the large lawn at Sheep's Meadow, head to the Central Park Zoo to see the animals, or ice skate in winter. A short walk from Times Square brings you to American Girl Place, The Disney Store, The NBA Store, and the other shops of Fifth Avenue. This is the neighborhood you want to be in during the Holidays, when the stores all have elaborate displays in the windows, the tall Christmas Tree at Rockefeller Center is lit up, and you can rent skates and try your double lutz on the rink. Just be forewarned that there might be a few people watching. Down the block is the Radio City Music Hall, which has an annual Christmas Show. If you continue south on Fifth Avenue, you'll reach the Empire State Building on the corner of 34th Street. You can head to the top of the 102-story building made famous by King Kong, but be sure to check out the 86th floor as well. This is the only stop where they allow you to walk outside and see the view. The Statue of Liberty and Ellis Island can be reached via a ferry from Battery Park, at the lower end of Manhattan. 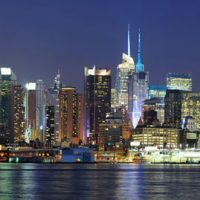 If you just want to see these sites without getting off the boat, opt to take a cruise around Manhattan on the Circle Line tours from Midtown Manhattan on the West Side. The ferry also goes under the Brooklyn and George Washington Bridges. The Marquis has several restaurants on property. For breakfast, you can grab coffee and pastries at Starbucks or hit the Crossroads Restaurant on the 8th floor for an a la carte menu that includes such specialties as lox, eggs, and onions scrambled in an omelette or a simple bagel and cream cheese. There's also a full buffet featuring all the usual fixings, like eggs, omelettes, pancakes, waffles, fresh fruit, cereals, and muffins. A continental option is available as well. Crossroads is also open for lunch. By far, the most impressive restaurant is The View on the 47th floor. Savor the best of New York state fare, like pan seared Hudson Valley fois gras, scallops, filet mignon, and an apple tart dessert as you take in the glorious views of Manhattan in the only revolving restaurant in town. The children might want to sit in the View's lounge and grab the cheese and dessert buffet. Mom and dad can join them as they sip on wine or margaritas. Open for dinner only, this small plates lounge allows guests to watch the game inside or enjoy the outdoor terrace when the weather is nice. The 4,000 square-foot glass enclosed fitness center is so large it could double as a gym for not only guests, but locals. There are more than enough aerobic machines and weights to keep you busy. Also on property are steam rooms and saunas, but no spa. This is a tough question because hotel prices always seem to be exorbitant in New York, easily the highest price per room in America. 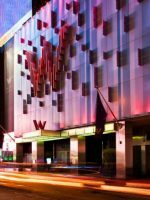 Avoid Thanksgiving through New Year's Eve, when the ball drops in Times Square, and room rates at the Marriott reach new heights. Autumn, when the city cools down a bit from its sweltering summer heat, can also be expensive. Summer gets a lot of international travelers who come to New York to do some serious shopping and sightseeing, boosting the price of a room once again. That leaves January through April as the best time to check out the city without the crowds. Also look into weekends, when business travelers are back home and the rooms open up again. 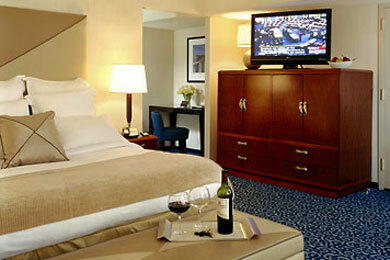 JFK Airport is about an hour from the hotel and LaGuardia Airport is located about 45 minutes away. The hotel does not provide shuttle service. Families can navigate through New York City on foot, by subway or by taxi. If you manage to sneak away for a couple hours, you can grab a romantic dinner at the View. Parents may also enjoy a horse-and-buggy ride into Central Park or taking a night cruise around the island on the Circle Line.